– Serious organized drone racing is a very recent phenomenon, but FPV technology, the key enabler for the sport, has a longer history. In a 2011 article, Smithsonian’s Air & Space magazine traces the birth of FPV remote control aircraft to the late 1990s, when cameras and transmitters became light enough to fit on small unmanned aircraft. 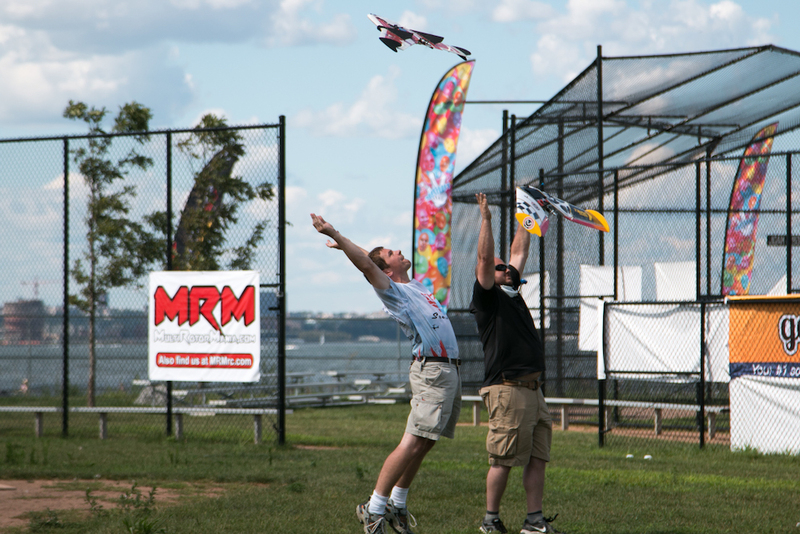 The first high-profile use of fast, agile FPV-equipped drones similar to those used in drone racing today was a series of flights by Raphael “Trappy” Pirker and his Team Black Sheep, who gained widespread acclaim and notoriety for flying around the Statue of Liberty in New York, among other places. In 2014, an RC flying club in eastern France posted a video of a “Star Wars-style” race in a local forest that attracted more than 3 million views on YouTube. – At roughly the same time, the FPV Explorers & Racers group launched in California and hobbyists in Australia began gathering in empty warehouses and parking garages for indoor races. – The Santa Cruz FPV Drone Race, held in April 2015, was the first event sanctioned by the U.S.-based Academy of Model Aeronautics, a large association for model aircraft enthusiasts. It was won by Zoe Stumbaugh (known as Zoe Full Throttle), who has attracted a large online following. – The first U.S. National Drone Racing Championships, organized by Rotor Sports, was held in July 2015 in Sacramento, California, drawing more than 100 competitors. 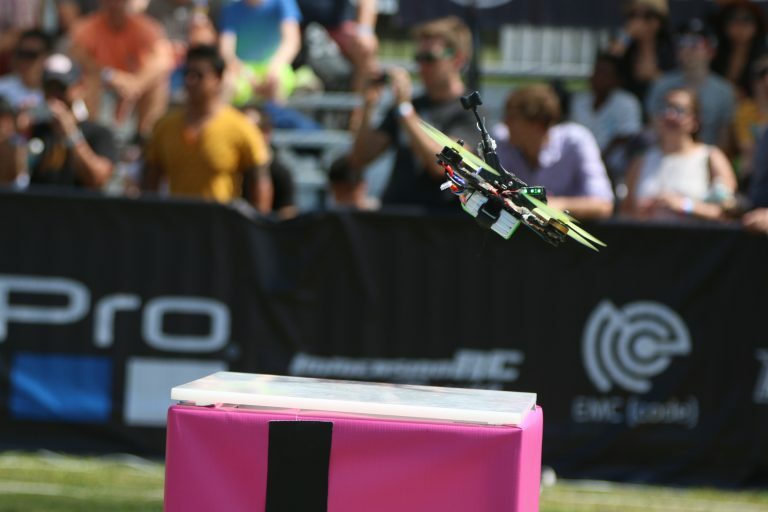 Chad Nowak, an Australian drone-racing pioneer known as FinalGlideAUS, won every event: the race, freestyle and team competitions. – In March 2016, a custom-built track and $1 million in prize money drew more than 150 racers to Dubai for the World Drone Prix, which is not affiliated with the Drone Racing Championships. The first prize, $250,000, went to 15-year-old Luke Bannister of England, who also took the top spot in a drone race the following month at London’s iconic Wembley Stadium. – The U.S. Drone Racing League was launched in early 2016 in a bid to establish drone racing as “the sport of the future.” So far, the League has held races in a power plant, an NFL stadium, and an abandoned shopping mall. Unlike other leagues, where pilots fly their own custom-built drones, DRL competitors must fly league-issued systems. – Drone racing puts a premium on both speed and maneuverability. Races are generally short, often lasting under a minute. Crashes are common. The most popular format has a group of pilots race at the same time over a course with multiple gates or other obstacles. The first drone to arrive at the finish line after a set number of laps wins. – During races, pilots use FPV goggles that display a live feed from a camera mounted on the front of the machine. Pilots rely on a real-time transmission from the drone: even brief lapses or slight jumps in latency can result in a crash. – Unlike most consumer quadcopters, which have their four rotors arranged in an X-shape configuration, many racing drones feature an H-shape layout. They are also generally smaller than popular drones like the DJI Phantom or 3DR Solo. A typical racing drone is about 250mm wide, measured diagonally, compared to the 350mm of a DJI Phantom 4. Crucially, these systems are much faster than consumer drones. Racing drones can reach speeds of over 80 mph, compared with the Phantom 4’s listed top speed of 45 mph. (See a breakdown of the technology in the Drone Racing League’s Racer2, and a comparison with typical consumer drones, here.) In other leagues, most racers build their own machines, but some hobby drone suppliers, including Horizon Hobby, have begun offering off-the-shelf racing drone kits. – National Geographic put together a rundown on how to get into FPV drone racing. MultiGP maintains a listing of racing clubs around the world. And would-be racers can test their reflexes at home in an online simulation of a Drone Racing League course. – With interest from ESPN, GoPro, Mountain Dew and major investors, several leagues are vying for supremacy. The Drone Racing League has so far received more than $8 million in funding, including a $1 million investment from RSE Ventures, a firm run by Miami Dolphins owner Stephen Ross. The DRL’s first race, in February 2016, was held at Dolphins’ New Miami Stadium. A second race was filmed in March but has not yet been posted online. The league did debut a new site in early August, droneracingsafety.org, that offers detailed advice on organizing a drone race. – The Drone Sports Association, which hosted the 2016 U.S. National Championship, will host a World Championship in Hawaii in October. The event will also be broadcast by ESPN. The DSA was formed in July of this year, following an aborted merger between its predecessor, RotorSports (which organized the 2015 National Championship), and the International Drone Racing Association (IDRA). – The IDRA was a partner in the World Drone Prix in Dubai and signed the initial broadcast agreement with ESPN when IDRA was set to organize the 2016 U.S. National Championship. After that event came under the auspices of the Drone Sports Association, the IDRA sanctioned the GiGA Drone Racing World Masters in South Korea—that event occurred on the same weekend as the U.S. National Championships. The association’s future plans are not yet clear. – The new DR1 race series, which launched this summer with a race at Sepulveda Dam in Los Angeles, is sponsored by Mountain Dew and streams live on Twitch. DR1 is perhaps the most prolific content producer among the rival leagues, with its inaugural DR1 Invitational featured on the Discovery Channel and the Science Channel, in addition to online streams. – DR1 has also established a partnership with the MultiGP Drone Racing League, which claims more than 700 chapters worldwide and nearly 10,000 pilots. MultiGP is taking an explicitly grassroots approach for its 2016 Drone Racing Championship, featuring open regional knockout competitions leading up to the final on Labor Day weekend at the Academy of Model Aeronautics headquarters in Muncie, Indiana. – There have been many drone racing events organized by regional entities. One notable example is Las Vegas’ Xtreme Drone Circuit, which includes flaming hoops as obstacles. It is scheduled to host its third $10,000 tournament on Sept. 9. – Several regulatory questions hover around drone racing in the U.S., starting with the cornerstone enabling technology of the sport: FPV. A June 2014 FAA interpretation of the Special Rule for Model Aircraft states that these regulations “preclude the use of vision-enhancing devices” including “goggles designed to provide a ‘first-person view’ from the model.” Under the long-awaited Part 107 rules, which take effect August 29, commercial drone operators are required to maintain a direct, unaided visual line of sight with the drone, a requirement that potentially precludes the use of FPV systems by pilots. Part 107 rules also prohibit the use of drones over people who are not involved in the drone operation. – But more broadly, it is unclear whether drone racing, which is organized by for-profit businesses, counts as a “hobby or recreational” use of drones according to Public Law 112-95, Section 336(c), which exempts model aircraft flights from new FAA rules. – Events that are held indoors are not subject to FAA airspace regulations. The Drone Racing League’s events so far have been held inside buildings such as abandoned shopping malls. 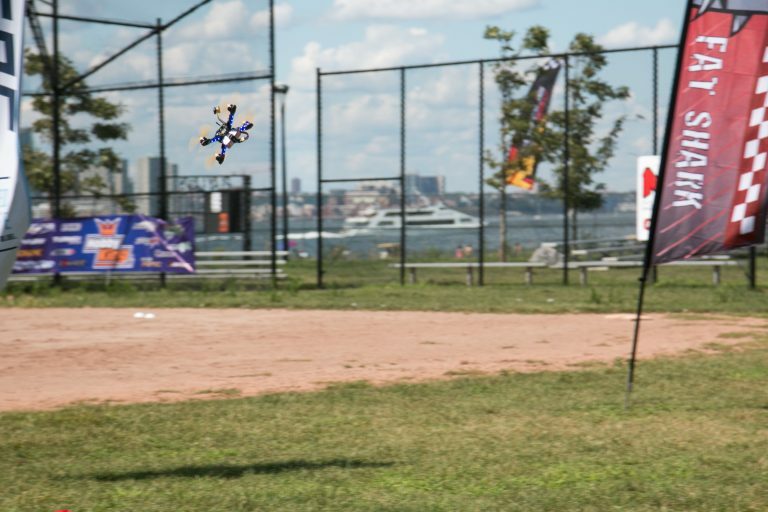 The FAA has demonstrated interest in drone racing; according to an August 2015 article in IEEE Spectrum, two of the agency’s representatives attended the 2015 National Drone Racing Championship. – Racers, drone racing entrepreneurs, and investors express hope that the new sport will follow the trajectory of competitive computer gaming, which is expected to generate $463 million in worldwide revenue in 2016. One challenge is the profusion of competing leagues. Racer Zoe Stumbaugh cites the example of professional football: The sport didn’t really take off until after the NFL-AFL merger in 1966. – Individual pilots are also vying to make a name for themselves, mainly by posting videos on YouTube and on Airvuz, a drone video site popular with racers. Charpu, the flight name of Los Angeles-based Carlos Puertolas, has perhaps the largest YouTube following. He was featured last year in a profile in The New York Times. – Purpose-built racing courses are starting to appear. The San Francisco-based Aerial Sports League has opened a Tron-inspired “Darq Traq” at the city’s Innovation Hangar. And the world’s largest consumer drone maker, DJI, is opening a 15,000-square-foot DJI Arena in Seoul in mid-August. – Drone racing could be ideal content as virtual reality hits the mainstream. 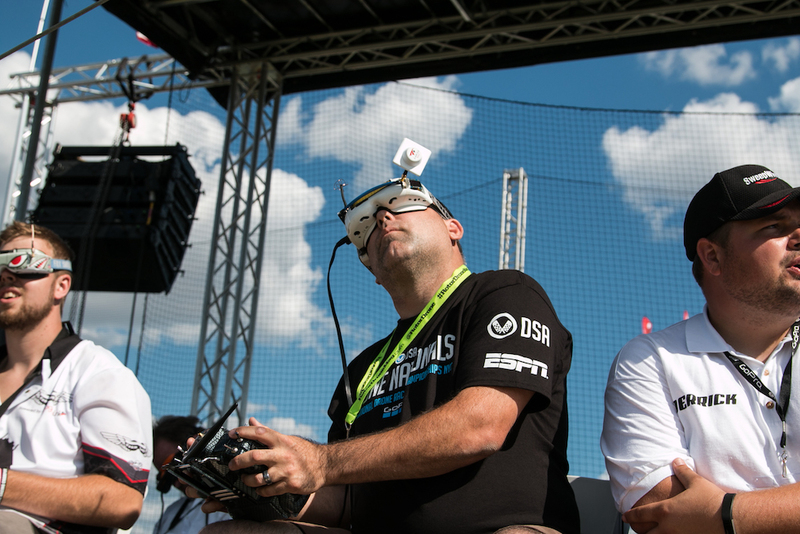 Matt Higgins of RSE Ventures told ESPN that drone racing “has all the makings of a modern-day sport: Twitch meets Formula One.… and first-person viewing lends itself to an amazing spectator experience with virtual reality.” The problem is, current technology still isn’t good enough to transmit first-person footage in HD — and even pilots say it takes a while to get over the nausea brought on by all that high-speed motion. – Eventually, human pilots might be able to ditch their handheld controllers. This April, engineering students at the University of Florida held the first brain-controlled drone race. Contestants directed DJI Phantoms in a slow-motion sprint over a 10-yard course. For updates, news, and commentary, follow us on Twitter. Subscribe to weekly drone news from the Center for the Study of the Drone. It covers news, commentary, analysis and technology from the drone world. You can subscribe here.